2005 average nitrogen dioxide concentrations for the Northeast. 2011 average nitrogen dioxide concentrations for the Northeast. Average nitrogen dioxide concentrations in the U.S. for 2005. Red denotes high concentrations, yellow medium, and blue low. Average nitrogen dioxide concentrations in the U.S. for 2014. It’s possible to track air pollution from space. NASA scientists did that with high-resolution satellite maps. To gather the data, they used an ozone monitoring instrument on board NASA’s Aura satellite. That tool tracks atmospheric gasses. 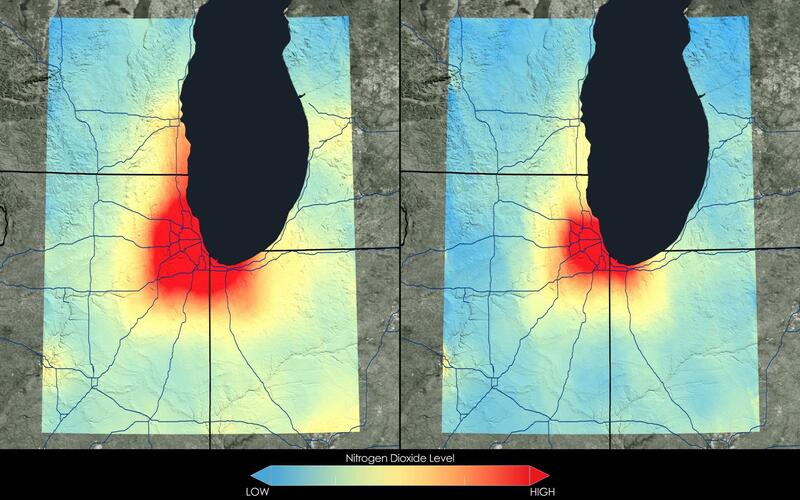 Nitrogen dioxide levels in 2005 are shown in the top image. 2014 levels are shown in the bottom image. The team of NASA scientists tracked emissions of nitrogen dioxide from 2005 to 2014. Nitrogen dioxide comes from cars, power plants, and industries, and it plays a major role in forming smog. Bryan Duncan is an atmospheric scientist with the NASA Goddard Space Flight Center. 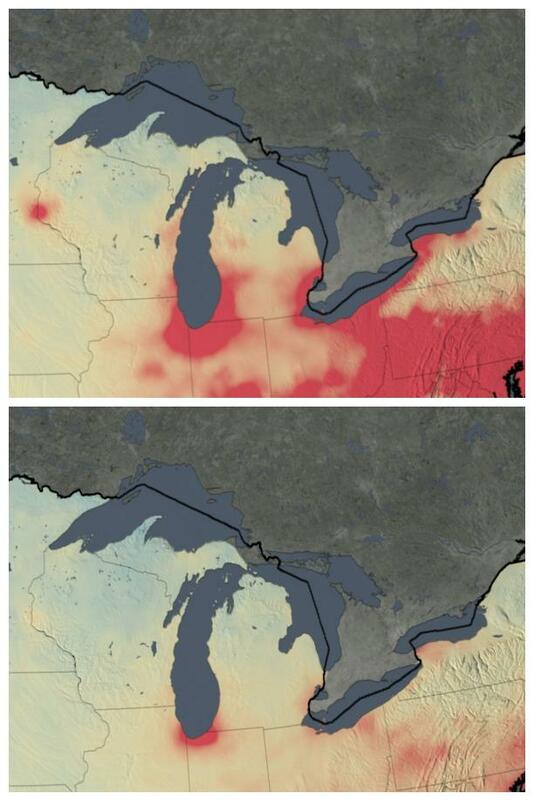 He says nitrogen dioxide emissions have decreased significantly around the Great Lakes region in the last decade. He says they observed that emissions decreased by 40% in Detroit, by 42% in Chicago, and by 30% in Toronto. Nitrogen dioxide doesn't last in the atmosphere for very long, Duncan says. “It only hangs around for a day or two,” he says. “So you can actually see where it’s being emitted." He says you can track other gasses this way too. Duncan says sulfur dioxide levels also fell over the last decade. Tracking these pollutants from space, he says, gets a little bit complicated. On the left you can see nitrogen dioxide levels for Chicago between 2005-2007. On the right, you can see the levels between 2009-2011. “To give a short answer, the satellite actually intercepts sunlight, then it’s reflected back from the Earth’s atmosphere and is intercepted by the satellite,” he says. It’s that process that allows NASA scientists to determine the concentrations of different pollutants in the atmosphere. “The satellite data is at such high quality that we can actually zoom in to the city level and we can look at spatial changes in pollution within an urban area,” Duncan says. He says they can also see differences when power plants implement emission controls. "We can see the level of pollution drop dramatically just in the course of a few months,” he says. What can people do with this data? Duncan says having access to high quality data like this is exciting for scientists. Many are using the data to monitor pollution levels around the world. “Some people are actually using it for health studies, to understand the health effects of pollution on the local population,” he says. And Duncan says you don't have to be a scientist to learn from the data. He says anyone can use it to find out what pollution levels look like in their areas. “And I think that’s the first step for many people, is just understanding what their pollutant levels are,” he says. To find out air pollution levels near you, you can visit this NASA website.